It's one thing to have your flight delayed for a long time. At least you can grab some food or drinks and hang out. But if there's nobody working at those restaurants and bars, you're in for a miserable day — and that's what's currently happening at San Francisco International Airport this morning. FlightAware is reporting that SFO is on a ground delay program, with flights being held at their origin cities for 3 hours and 40 minutes on average, due to low ceilings. Interestingly, flights at Oakland International, just across the bay, are showing no delays. 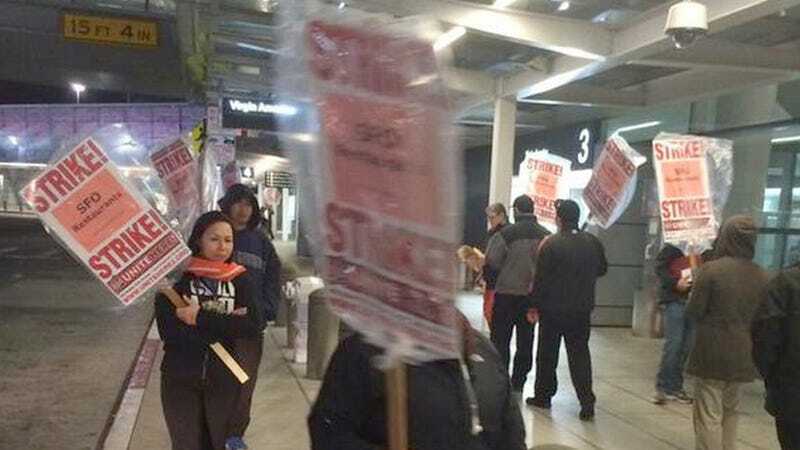 What is making the delays even worse, is that the airport's food service workers are on strike today, protesting for higher wages. Unite Local 2 says their membership will be on strike for 48 hours, from today through Saturday. They're encouraging travelers to bring their own food to the airport.